Except for perhaps restaurant coverage, when the topic of food in Argentina is covered by guide books, travel articles, and blogs the authors usually stick to the usual suspects like beef and huge steaks, pizza, pasta, and empanadas. I guess I’m not helping too much with a site that is largely dedicated to cooking beef and asados but, you know, that has always been the mission of this site. Therefore, I’m going to go off topic here for a bit–like that has never happened before–and list some of the many gourmet and artisanal products that are produced by hard working small businesses around the country. Whether they were formed by families or friends, the visions were clear: to offer delicious gourmet products, inspired by regional cuisines and ingredients in Argentina or from around the world. In 1969, The Weiss family started their business in Bariloche with a mission to produce a high-quality smoked product of locally-raised trout. Ahumadero Familia Weiss has since expanded their smoked product line to include a delicious selection of cheeses and meats such as deer, boar, and salmon. In addition to their smoked products, Weiss also produces fine salamis, cured Parma-style ham, cured beef tenderloin, and pates. If you ever have the chance to browse through their store in Bariloche, you can also stock up on a variety of preserves, teas, sweets, and herbal cosmetics produced by other artisanal businesses that are based throughout Argentina. The Flamarique siblings Mariana, Jose, and German formed Almacen del Sur, under Puerta Sur S.A., with the mission to produce a line of upscale gourmet products, perfect for pairing with the finest of wines. Their historic farm located in Maipu, just outside of Mendoza city, not only produces the wide variety of herbs, spices, and vegetables that go into Almacen del Sur’s products, but also of offers tours and the option to try their goods at an on site restaurant. Almacen del Sur’s range of products go from savory conserved vegetables and spreads to sweet jams, jellies, and syrups. Oven roasted garlic, green tomato chutney, piquillo pepper strips, and roasted zucchini are just a few of their conserved products. Spreads include rucola and almonds, olive, roasted garlic, broccoli, eggplant, sundried tomato, and picquillo peppers. Preserves such as rose petal, grape, or quince. Jellies made with quince, malbec wine, or torrontes wine. Their malbec wine jelly was actually a silver finalist under the Outstanding Jam, Preserve, Honey or Nut Butter category at the 2009 Summer Fancy Food show in New York. Siblings Maria Cecilia and Marcelo Zunino founded De Mi Campo back in 2000 on their grandparents’ 40 hectare estate in Barreal, San Juan. The soil, climate, and surrounding waters create the perfect environment to grow the organic herbs and vegetables that go into De Mi Campo’s gourmet products. Dressings include balsamic and wine vinegars, chimichurri, and malbec sauce. Their sweet preserves lineup includes spaghetti squash or malbec jam, figs or pumpkins in syrup, and various quince products. Jars or canisters of organic dried herbs and spices like tarragon, marjoram, black pepper, paprika, rosemary, sage, and thyme. Their conserved artichokes, olives, and sun-dried tomatoes are fantastic for picadas or antipasto. Herbal products for infusions include chamomile, lavendar, peppermint, and melisa. For a good part of her life, Frida Perel worked at her grandfather’s silverware factory until the business was sold in 1997. In the years that followed Frida built sales teams at an insurance company until, in 2004, she decided the time was right make a name for herself. After some inspirational talks with one of her brothers, who runs a successful specialty food company in the U.S.–Cuisine Perel, Frida and her friend Jorge Plotinus saw the potential to develop a similar business here in Argentina. Today, Familia Perel, has four brands under their belt: Border-Line, La Cocina del Vino, donna Mara, and Frida Perel. The first two target the gourmet food retail market. Border-Line’s lineup consists of a small selection of fruity cocktail flavoring products from syrups infused with berries, passion fruit, lime, or mint to rimmers such as strawberry dacquiri, blood orange mimosa, lime caipirinha, and mint citrus mojito. La Cocina del Vino transforms natural fruit juices, herbs, spices, wines, champagne, and liqueurs into a gourmet collection of oils, chocolate sauces, dips, and vinegars. Their six varieties of grapeseed-based oils are infused with the flavors of jalepeño pepper, roasted garlic, toasted hazelnut, garlic & basil, cilantro & citrus, and black truffles. All of their vinegars are based on different varietals of wine and include such flavors as chardonnay pear, blood orange, Late Harvest red wine blended with grape juice, pecan nut balsamic, Late Harvest torrontes, and balsalmic merlot. Although labeled as bread dippers, the Cuyo dipper made with jalapeno oil, peppers, and onion or the Patagonic dipper made with rosemary, basil, lavender, black pepper and toasted garlic are suitable for use in marinades, pasta recipes, and stews. On the sweet side exquisite chocolate sauces include flavors such as malbec coffee, raspberry chardonnay, mint champagne, and Grand Marnier. Founded in 1992, Granjas Patagonicas, based in Bariloche, Argentina, produces a wide variety of smoked products, pickled meats, and paté. Flavorful game and farm-raised meats, found throughout many parts of Patagonia, such as salmon, trout, boar, lamb, and deer are smoked and sold in vacuum packs, packed in oil, or whipped into pate. 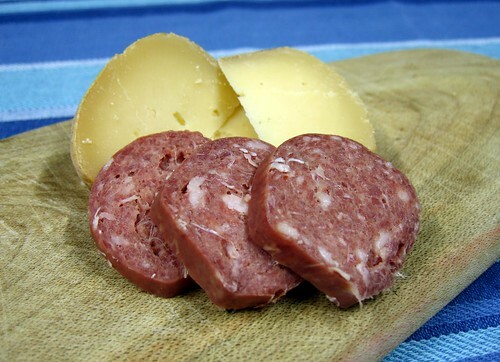 Rich smoked cheeses, sold alone or wrapped around various smoked meats. Deer, trout, and salmon pickled with herbs and spices. Smoked spices such as dehydrated onion and garlic flakes, salt, curry powder, peppers, and masala mix. Founded in 2004, Tadley S.A. created a line of teas, under the brand Inti Zen, with the mission of “seeking to integrate the energy of the Andes, the untamed nature of Patagonia, with the Art of Tea and wisdom of the Eastern World.” With South American-inspired names, much of Inti Zen’s teas are blended with Patagonian flora and flavors. A couple of examples are, Tea for Tango blended with yerba mate and jasmin flowers and Don Juan with hints of dulce de leche. In 2001, Gaston Furlong and Valeria Hermida launched their small company with a mission to produce high quality olive oil and preserved olives. Their 40 hectare farm, in the province of San Juan, is at an ideal location which offers just the right soil and climate conditions needed for growing olives. What makes La Acequia’s olive oils unique from others produced in Argentina is that they are bottled unfiltered. As with unfiltered beer, this process helps to preserve a fresh flavor while keeping all of those wonderful antioxidants around. La Acequia’s list of olive oils are 100% Arbequina extra-virgin, 70% Arbequina extra-virgin & 30% sunflower, and 100% blended extra-virgin. Their four types of preserved olives are green arauco, green manzanilla, black manzanilla, and black picual. Created by a group of friends with the intention of producing high-quality honey from an environmentally-sound beekeeping operation, Pampa Gourmet to this day has over 400 apiaries under their belt. In addition to producing honey in general, Pampa Gourmet has a product line that includes a variety of honey-based jams and sauces as well as a newly introduced lineup of chimichurri and tangy Asian-inspired sauces. Honey-based products include peach, plum, or berry jams, fruit chutney, spicy meat sauce, and honey-mustard. Sweet sauces made with berries and malbec or chocolate and caramel are designed for pouring over desserts.. Their new lineup includes: hoisin Sauce flavored with plum, soy sauce, ginger and torrontes wine; teriyaki Sauce with soy, ginger and torrontes wine; chimichurri with malbec wine; spicy mango sauce. Founded in 2001, Quinto Sabor started their company out of a shopping gallery in Bariloche selling spices and natural products. 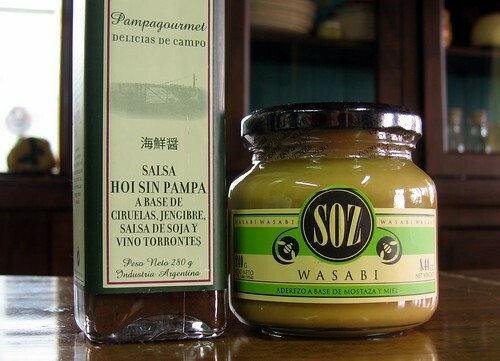 Having moved to a much larger location in 2003 in order to expand their operations, Quinto Sabor produces and sells a variety of gourmet sauces, chutneys, mustards, preserves, pickled vegetables, and seasonings that reflect the flavors of Patagonia. Their sauces go from typical chimichurri and simple hot sauce to a hot sauce flavored with raspberries and a yogurt-based sauce with raspberries and shallots. Quinto Sabor’s lineup also includes liquid smoke, green tomato and apple chutney, pickled spicy vegetables, mole andino (A Patagonian-inspired take on Mexican mole sauce with rosehip flesh and pine nuts from the monkey-puzzle tree), and two types of mousse made with wild mushrooms and tomatoes. In 2004, brothers Hernan and Federico Garcia Lahitou and friend, Juan Giustozzi, decided to take their hobby of creating small batches of gourmet honey mustard to the next level and founded Soz. Today, their small lineup of flavored mustards, inspired by different regional cuisines around the world, have hit the international scene in various countries throughout the Americas and Europe. In addition to their original concept of honey mustard, their collection consists of flavors such as honey dijon, wasabi, olive oil & balsami vinegar, and jalapeño. In 2002, the Almeida family built their business out of a dream to produce gourmet cookies, both sweet and savory, using both high quality ingredients and high standards. With the need for a much larger facility in 2006, Sugar & Spice moved to a new location, in the Buenos Aires neighborhood of Palermo, that could both house their factory as well as a retail store. For sweet cookies they offer American-style chocolate chip, oatmeal & raisin, and dark chocolate with white chocolate chunks. Their savory cookies, or copetines, lineup includes pizza, parmesen with walnuts, pesto, and fugazza (parmesen, onions, and thyme). Other products include biscotti, cantucci, brownies, pound cakes, stollen, and panettone. Major supermarket chains such as Jumbo, Carrefour, Disco, and Coto or department stores such as Falabella. The Falabella on the pedestrian street Florida 343 in Buenos Aires has a section with numerous gourmet products and is probably the easiest shop to reach for anyone traveling to the capital. Wine shops and delicatessens (fiambrerias). These shops are typically very easy to spot with their large window displays of wines and food. In Buenos Aires, check around the popular downtown retail areas, Avenida Santa Fe, or Recoleta and Palermo neighborhoods. Duty Free shops at various airports throughout the country. I will add to this post in the future.